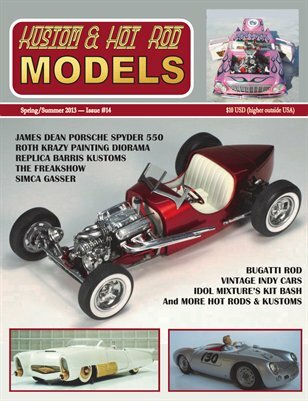 Aa you can see from our cover, we've got coverage of some of the WORLD'S BEST SCALE MODEL CAR BUILDERS! Yet, there are no stuffed shirts here. KAHRM is done by long time builders and enthusiasts, yet give the average Joe the opportunity to get involved. If your forte' is vintage style hot rods, stock, kustoms, and racing, then you have come to the right place. We aren't 'general interest', and don't try to cover all aspects - we focus! You don't have to wade through page after page of models that don't interest you here. It's all good! Ideas galore from all over the world.